On Saturday morning I watched Tyler set a world record for the fastest half marathon ever run a treadmill. He accomplished the feat running on a machine set up in the front of the Marathon Sports store near the Boston Marathon finish line in front of a crowd that included friends, family, members of the media, and a few people who arrived at the store expecting to buy shoes and ended up staying for the drama. The idea of staging this very public WR attempt had followed a fundraising event in the fall that also involved treadmill running. For that previous event, Tyler had challenged himself to run as many consecutive 5-minute miles as possible on a treadmill and had asked people to pledge a certain amount for each mile. The funds would support the charitable work done by Strive Trips, Inc., the organization that he co-owns with two friends. 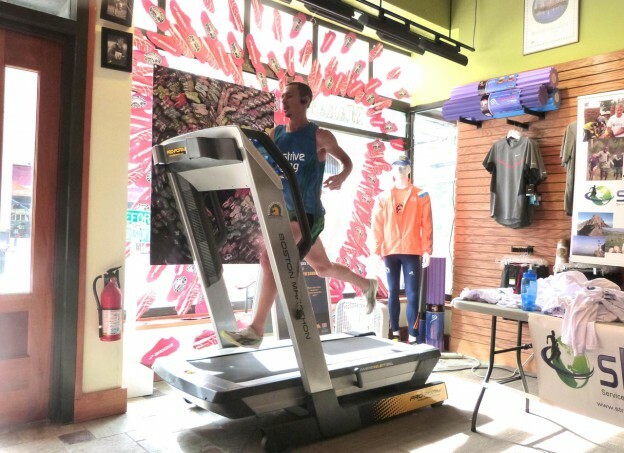 On that day last November, he set the treadmill at 5:00 pace and didn’t stop until he had covered 13.2 miles, passing the half marathon in 1:05:30. It was only later that he found out that, had it been done in a certified WR attempt, his time would have beaten the listed world record of Olympic steeplechaser Andrew Lemoncello by two minutes. With the help of Karyn Miller-Medzon, parent of a Strive student, and producer for NPR’s Here & Now, Tyler planned an encore for the spring, but this time doing it according to all the guidelines required for record consideration. I hadn’t planned to take much of an active role in the attempt; I was just there to support Tyler and cheer him on if he needed cheering. Instead, I ended up becoming the emcee and a part of the spectacle. Tyler had written down the splits he would need to break the record, and, since I never travel anywhere without a stopwatch, I volunteered to take his actual splits and announce them to the crowd. After I had done this for the first 2-3 miles, I realized that these periodic updates were the only way that the crowd knew what was going on. Although Tyler was able to see the treadmill console, and so knew his pace and his splits, everyone else just saw him running in place, becoming progressively more tired and sweaty. The first couple of miles, my announcements were pretty vanilla, but as the minutes went by, like everyone else I started getting caught up in the building tension. Tyler was slowly building up a cushion, but as his feet continued to slap the belt of the relentless machine as it sped underneath him, I thought his face was beginning to express something more than concentration, something that looked like the beginnings of fatigue-despair. After he had reached 7 miles, I walked around to the front of the machine, holding up a piece of paper with his last several splits. He looked at them for a split second and then closed his eyes. There was a long way to go. In between checking mile times, I had lots of time to walk over to talk to Tyler’s parents, as well as check in with Karyn, who was recording the event, and say hello to a few other people I recognized. Tyler ran his 8th mile in 5:05, and then a few moments later, there was an audible change to the sound of the treadmill motor. Several of us looked at each other and wondered what had just happened. What had happened was that Tyler had punched in a new, slower tempo. After six straight miles of hearing the same note, the Doppler shift to a lower pitch sounded ominous. Tyler ran his 9th mile in 5:22, putting him a mere 5s ahead of the WR split. A moment later, he increased the speed again. Mile 10 was 5:08. Sensing that this was getting serious, the crowd began to offer shouts of encouragement without being prompted. I can only imagine what Tyler’s parents were feeling at this point. When Tyler punched the controls to slow the pace again, we knew what it was right away. The 11th mile passed in 5:18. For the first time, Tyler was a few seconds behind WR pace with two miles to go. Reaching deeper, Tyler increased the pace. He ran the 12th mile in 5:11, meaning he would need to run 5:37 or better for the final 1.1 miles to get the record. Later, Tyler would say that in addition to being really tired, his calves were killing him, perhaps the result of trying to generate speed on the soft surface of the treadmill, or perhaps because he hadn’t done sufficient training at 5:06 pace. Nevertheless, he threw himself into the final mile with a vengeance. He hit 13 miles in 1:06:50, a 4:58 split, and reached 13.1 in 1:07:19 before stepping off the treadmill and collapsing on the floor. He had broken the record by 10 seconds. Under almost any circumstances, a treadmill record attempt is a strange sub-genre of distance running. Heading into Boston to watch, I didn’t really know what to expect. In the end, what impressed me most was what a collective effort it was. Of course, Tyler did all the actual running, but the record is, by definition, public “property” (the venue must be open to the public at all times). On a deeper level, Tyler wouldn’t have been there at all if it weren’t for Strive, and who knows whether he would have found the determination to push on without the motivation and encouragement of the crowd around him. Great accomplishment (especially considering the lack of changing scenery or the usual cooling headwind from moving forward), great writing. I also have to mention that the times for 13.0 and 13.1 miles appear to be have been transposed. Thanks for the comment and the correction, Rick. I’ve fixed the typo in the post.